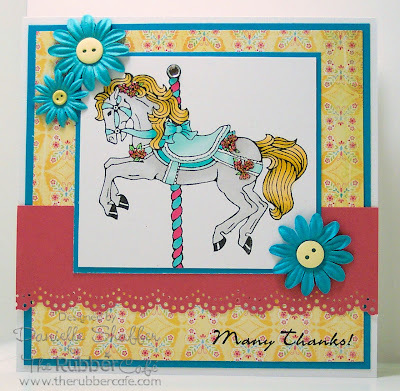 Of all my stamps from The Rubber Cafe, this Carousel Horse is my all time favorite! Not only is it the kind of stamp I can use on Birthday or Thank You cards, but it is super fun to colour! I used my Many Thanks sentiment for this card and I added some stickles on the flowers this time and a little gem on the ball at the top of the pole. This is stunning, that stamp is totally amazing!!! Love the yellow BG paper too!